For the second winter in a row I have found cause to visit the north Swedish landskap of Västerbotten and in particular its two largest cities, Umeå (population ca. 80,000) and Skellefteå (population ca. 33,000). A personal account of the transport observations garnered during these visits, however, is less a matter of views from the street as those from a few feet above it. During this time the street as a physical reality is far from eternally visible and is instead recurrently masked by ice and heavy snowfall. The British as we all know love to talk about the weather but we aren’t so good at actually handling it. As a Londoner I am accustomed to the scare mongering associated with even the mildest forms of inclement weather that is promulgated by the authorities and the media. I am often embarrassed by the seeming inability of the transport infrastructure of my birthplace to withstand even the lightest snowfall or drop in temperature below 0°C. As such I am always interested in drawing comparisons and noting how other cities and countries handle the same pressures. Previously, I have mostly drawn such comparisons with Berlin, my place of residence and from where I now write. But as the sirens wailing outside indicate another spat of pedestrian falls due to icy un-gritted streets I realize now that there are perhaps other regions and cities even more qualified in handling the weather and deserving of my envy. Approximately 600 and 800 kilometers north of Stockholm, respectively, Umeå and Skellefteå lie on the Gulf of Bothnia. Both have subarctic climates characterized by lengthy winters from October to March when temperatures regularly fall below -15°C and snow is present for long periods. Both lie on European highways and are flanked by two mainline railways in Sweden’s interior of which one links directly with Umeå and Skellefteå thanks to branch railways. The branch to Skellefteå, however, is not operated for passenger travel. Umeå, in addition, has had a direct high-speed rail connection to Stockholm since 2010. How does each of these modes of ground transport stand up to the region’s adverse weather conditions? And what technologies have emerged to help people stay mobile amidst the snow and ice? The personal reflections offered below hint towards some answers to these questions. 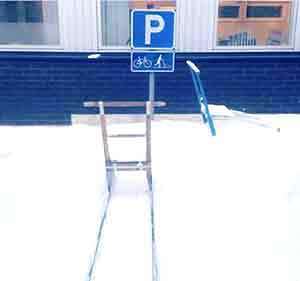 A dedicated spark parking place. Photograph courtesy of Karolina Andersson. My first observation of winter transport in northern Sweden was not directly related to the more formal modes of collective road and rail travel. Instead it was sparked by my first introduction to a kick-sled or in Swedish a ‘spark’ (no pun intended! see photo above). A spark is essentially a wooden chair whose backrest provides a handle attached to two metal blades that then extend backwards for a length that is about double that of the chair. It is propelled by human power with the driver standing on one of the blades and kicking the ground with their free foot. This leaves the chair free for a passenger or luggage. Their origins date to the late nineteenth century but they remain a relatively common sight on the streets of Umeå and Skellefteå. They are a fun and environmentally friendly way to get around in the snow and ice even if they are not particularly fast or easy to steer. As such they provide an alternative to cycling, which requires particular skill during the winter, and they often prove more convenient for shorter trips or a more enjoyable option for those travelling with young children. For the most part people navigate these cities, however, by road either in private cars, taxis or public buses. When travelling in this way, more so in private cars and taxis than in buses, I was increasingly aware of the drivers’ ability to navigate icy roads thanks to an almost instinctive or habitual awareness of how a vehicle interacts with a winter surface – a skill that I neither poses or have come across so explicitly in the UK or Germany. Although there are certainly exceptions, such skills often seem to be reflected in a style of driving that is characterized less by speed than by patience and foresight. They and any single driver’s accrued experience have recently been supplemented by technological developments such as the introduction of anti-locking brake systems (ABS) and there regulatory prioritization (since 2007 ABS is legally required of all new passenger vehicles sold in the European Union). Similarly, the safety of the roads is ensured by extensive gritting programs that have the side affect of acting as a popular barometer for the winter’s severity. For example, in Skellefteå the local news recently reported that due to milder weather, a lack of snowfall and therefore increased ice, the town had used more grit in December 2013 than it had during the entire previous winter. Grit that cause havoc to those who prefer to travel by spark. 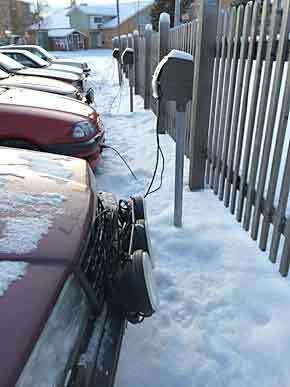 A common attentiveness to the weather’s affect on road travel is further highlighted by the widespread practice of plugging one’s car into an electrical socket in order to warm the engine to ease its ignition and in turn reduce its environmental impact. A line of motor warmers in Skellefteå. Photograph courtesy of Kurt Sundström. The challenging nature of the climate and the need to overcome it is not always negative. It might in fact provide economic opportunities for the region as demonstrated by plans that I recently heard about to resurrect a long abandoned railway line. Feasibility studies are currently underway in the region with the prospect of reopening a seventy-five kilometre stretch of railway between Jörn and Arvidsjaur. The railway was built in the 1920s to link Sweden’s two primary north-south railways and to provide for the transport of freight. Although sections of it have previously been used to test the winter performance of Sweden’s rolling stock, the majority of it has been out of use since 1990. Now Lars-Åke Tjernström, owner of McLead AB has come up with the idea of establishing an international train testing facility along the route in recognition of the limited winter testing facilities offered elsewhere in Europe. As Lars- Åke explains on his company website: “We have perfect climatic and geographical conditions. An unused sector of track such as that between Jörn and Arvidsjaur is hard to find anywhere else, and with its topography the test track will be unique in Europe.” The proposal acknowledges the recently re-emphasized disruption to rail traffic caused by cold meteorological conditions in Scandinavia and beyond – along with the need to develop train design accordingly. Likewise it provides a solution to the problem of trying to conduct tests in real-world scenarios on Europe’s already heavily-loaded rail network. If the feasibility studies prove that the market conditions, and technological, expertise and investment requirements are all optimal the facility, which is currently being refereed to as Rail Test Nordic, could create significant employment in the region. Who knows, if it proves successful perhaps even British trains will pass its tests and my envy will be allowed to subside a little.